Abby Johnson’s story spread rapidly back when she went from being a leader in Planned Parenthood and one of their clinic directors, to a committed pro-life advocate, in short order. After witnessing the horrifying sight of one abortion on an ultrasound screen. Now, she tells her compelling and dramatic story in unPlanned, a new book about to be released. Great title, heart-stopping drama. It should certainly be a debate changer. 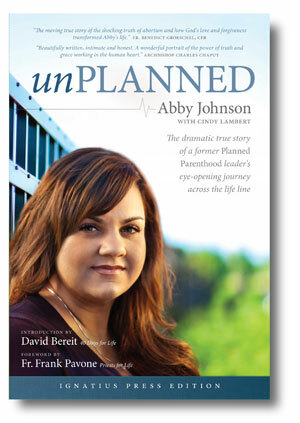 I had an advance copy of unPlanned, and interviewed Abby Johnson last week. We never got past chapter one, “The Ultrasound.” When I read it the evening before the interview, I was thunderstruck. After the final sentence of that chapter, I perceptibly exhaled. And realized I had been holding my breath. It was captivating. I reveal my story not because I am proud of it. I am not. But my thinking and choices are not unlike those of so many people I have encountered. And until we each set aside our own preferences for how we wish others would think and behave, or how we assume others think and behave, we won’t be able to understand those with whom we differ in order to engage in real dialogue and discover truth. People have asked her things like how she could have been so naive, or gullible, or inconsistent in holding Christian values but not acting on them, etc… She understands the difficulty in understanding this whole business, on both sides. To this day I have friends on both sides of this polarizing debate. We all long for a story that shows that “our” side is right and good, and “their” side is wrong and bad, don’t we? But…we have far more in common with the “other” side than we might imagine. She’s singing my song. For years and years, I’ve tried to generate a conversation between those who disagree on the big life issues, with the presumption of goodwill that probably, people on both sides are acting on what they believe to be what’s best for women and/or children and/or other groups of human beings in the life debate (the impaired or dying, if the debate is euthanasia, for instance…). But after years of this, I’ve found precious few advocates of the most permissable abortion laws willing to talk to anyone who doesn’t share their views. It’s one thing to have friends on both sides, and I agree with Abby that I do as well. It’s another to generate that conversation, both talking and listening, engaging reason and charity toward the person and the argument. Planned Parenthood took Johnson to court in an attempt to keep a lid on her story. Johnson won. unPlanned is the result. This entry was posted in Abortion, Culture, Law, Media, Politics, Science, Society and tagged Abby Johnson, abortion clinics, Planned Parenthood, pro-life movement, ultrasound abortion, unPlanned by Sheila. Bookmark the permalink.